In Barbara Rick's acclaimed documentary, In Good Conscience, a most unlikely and very funny rebel - an American nun - finds herself at the center of a human rights storm with leaders of one of the world's most revered institutions, the Roman Catholic Church.This film chronicles the true story of Sister Jeannine Gramick, who is defying a Vatican edict that she shut down her compassionate ministry to gay and lesbian Catholics, and silence herself permanently on the subject of homosexuality. Her battle takes her all the way to Rome and to the door of her key adversary over the years: Cardinal Joseph Ratzinger, who would become Pope Benedict XVI.Sister Jeannine has worked within the church for more than thirty years on behalf of the LGBT community and its fight for acceptance, recognition, and equality. When issued this ultimatum from Cardinal Ratzinger and Pope John Paul II - denounce homosexuality or lose everything - quietly and with respect, she refused.I choose not to collaborate in my own oppression by restricting a basic human right, she says. To me this is a matter of conscience.Shot by legendary filmmaker Albert Maysles and executive produced by Humanitas Prize winner Tom Fontana, this laugh-out-loud film was called 'a masterpiece' by Oscar-winning filmmaker Barbara Kopple. 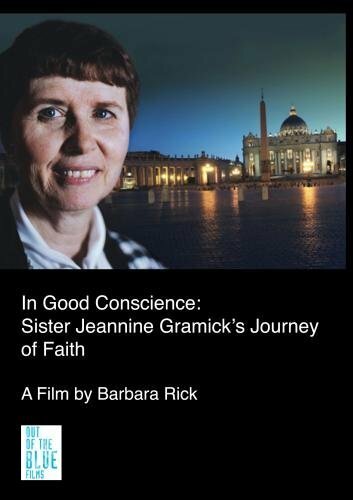 TimeOut NY magazine calls Sister Jeannine Gramick 'a freedom fighter on the frontlines of the cultural wars, adding, This gripping documentary by Barbara Rick is a must-see.When sold by Amazon.com, this product will be manufactured on demand using DVD-R recordable media. Amazon.com's standard return policy will apply. Manufacturer: Out of The Blue Films, Inc. Publisher: Out of The Blue Films, Inc. Studio: Out of The Blue Films, Inc. Brand: Out of The Blue Films, Inc. If you have any questions about this product by Out of The Blue Films, Inc., contact us by completing and submitting the form below. If you are looking for a specif part number, please include it with your message.